I know? What? But yes, tofu sticks. Alex and I were vegetarians for about eighteen years and in that time, we developed a few stand-by recipes that a)were economical and b)tasted somewhat like those beloved-in-childhood-fish-sticks. The kids spent their early years being exclusively vegetarian, and still eat that way nearly all the time. 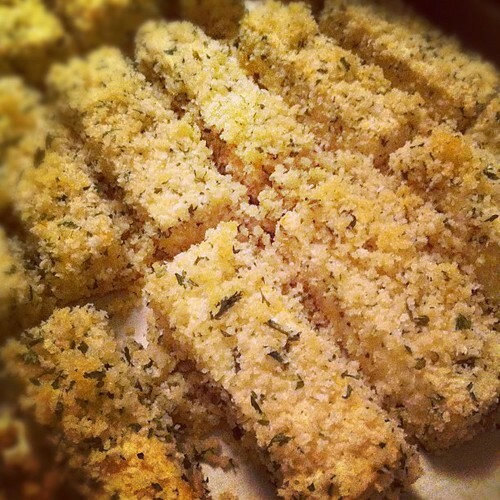 Tofu sticks became a staple recipe, beloved by everyone in our home. It's easily adjusted to suit your tastes--make them spicy, nutty, add nutritional yeast, there are many possible adaptions one could make. Here's our basic version. Preheat oven to 350F. 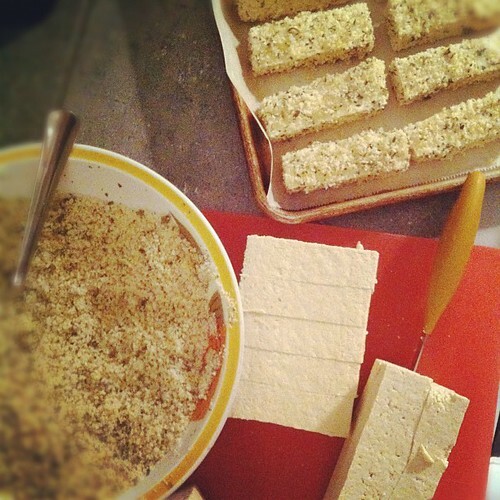 Depending on amount of tofu you are making, coat with oil or line with parchment, 1-2 11" x 17" baking sheets. Drain extra firm tofu cakes. How I do it: three cakes to a large dinner plate, second dinner plate on top, a mixing bowl or two on top to press it down, leave for 15 min. The liquid will not be reabsorbed and simply discard it when the 15 min. are up. Cut each cake down the middle, lengthwise. Then cut across the cake in strips (as shown in photo). This will give you about five 10-12 sticks, total. Mix 4 cups of bread crumbs and spices in medium bowl. Pour some oil (as needed) into a medium bowl. Coat each stick in oil. Then coat each stick in bread crumbs, place onto baking sheet. See? Easy. We like red quinoa and a salad to round out the meal. Tofu sticks are great cold, as leftovers, in wraps, too. And if you have children like mine, they'll be in the kitchen asking for cold bits of tofu while you are making dinner.